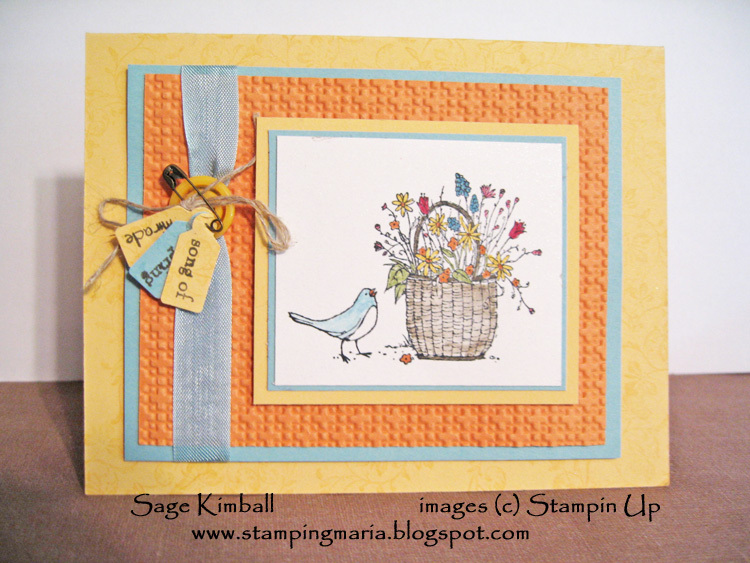 Maria's Stamping Station: Peace Within Card and 12x12 Cardstock Help Needed! Peace Within Card and 12x12 Cardstock Help Needed! Here's a beautiful card made by fellow Demonstrator Sage Kimball; she used the Peace Within Stamp Set that will be retiring the end of May. Peace Within is a great stamp set and the images look wonderful colored with Markers, Aqua Painters, or Blender Pens! Make sure you order Retiring Stamp Sets before they're gone - see the list HERE and don't miss out! Also, I wanted to ask for some help from my readers!! I have A LOT of 12x12 Designer Series Paper packs and 12x12 Simply Scrappin' Kits. My question is: What's the best way to ship this large paper? Do you use Priority Mail or regular mail? Where do you get the envelops to mail this large paper? The envelops I've seen are expensive (about $2 each) and when you add that cost to the cost of shipping-it starts to get expensive. If you read my postings through my subscription service, you can respond by clicking on "Reply" or you can contact me at: stampingmaria@yahoo.com. Have a great Monday and thanks in advance for your help with my paper dilemma! I love the card. That is such a cute stamp set. I would make a cardboard pkg for the 12x12 paper. Then the corners don't get ruffed up in the mail. Some old SU boxes or other boxes cut a bit bigger than the paper and taped with packing tape should do the trick. Thanks for the idea Jeanette; I'll give it a try!